After reviewing thousands of direct comments from student loan borrowers, consumer advocates, and members of industry, today we announced an updated student loan Payback Playbook prototype . We have now shared it with our partners at the Department of Education for implementation. We worked together with the departments of Education and Treasury to develop these prototype disclosures to ensure that student loan servicers provide the information borrowers need and can use to obtain monthly payments they can afford. The Payback Playbook is a first-of-its-kind set of disclosures that outlines a path to affordable payments for struggling borrowers who are trying to avoid student debt distress. In addition to delivering the revised Payback Playbook prototype, we shared with the Department of Education a summary of the feedback you provided to us as well as the findings from our extensive user testing. You can also read the comments we received on Regulations.gov . This summary is intended to help inform the Department of Education’s work to implement the final disclosures as part of the new vision for serving student loan borrowers and to improve the quality of information borrowers receive on their repayment plans. Student loan borrowers have told us they face many challenges when trying to access an affordable monthly payment. Borrowers also tell us they face challenges as they try to get more information on their options and experience servicing breakdowns when they try to enroll or remain in income-driven repayment plans. With these challenges in mind, the student loan Payback Playbook would provide federal student loan borrowers with personalized and actionable information on federal student loan repayment plans and help borrowers secure a monthly payment they can afford. The revised Payback Playbook that most borrowers would receive from their servicer would clearly present personalized information about the repayment plan they are currently enrolled in, as well as two alternative repayment plan options. 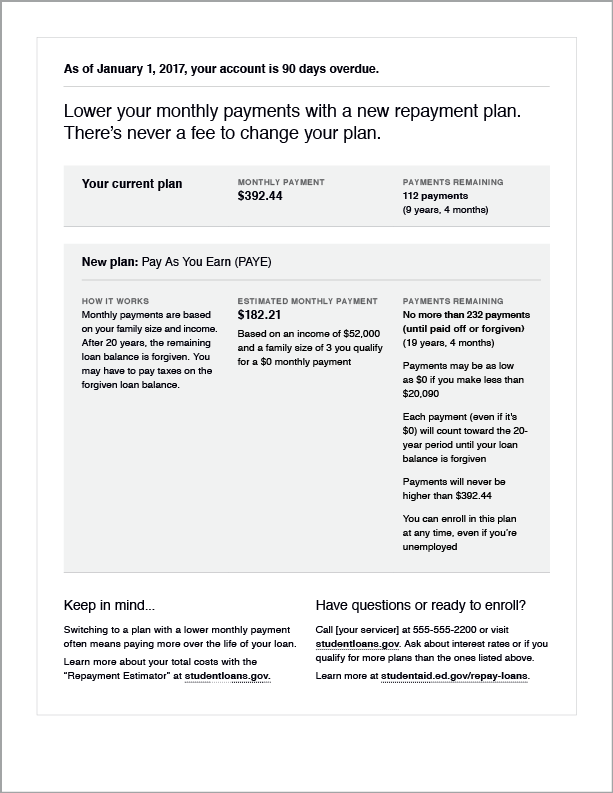 Borrowers who may be struggling or experiencing financial distress would receive a streamlined Payback Playbook that presents personalized information on their current repayment plan, as well as an alternative repayment option that offers the lowest available monthly payment and customized instructions on how to enroll in the repayment plan. Personalized repayment plans: The revised Payback Playbook would provide personalized information tailored to a borrower’s specific circumstances and show what their estimated payments would be under different repayment plans. This information would include the estimated number of payments over the life of the loan, the monthly payment amounts, and whether their monthly payment amount will change over time. 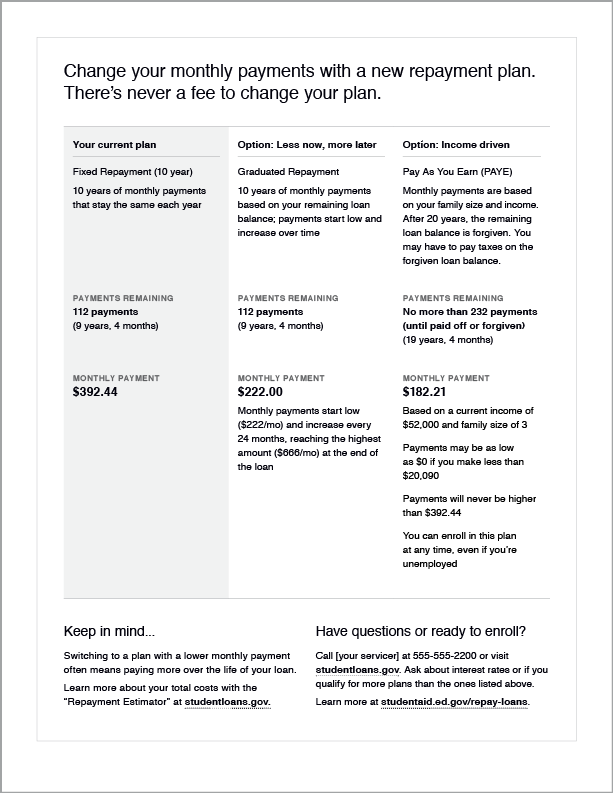 No fine print: The revised Payback Playbook describes each payment option using clear, straightforward language that makes it easier for a borrower to understand the different plans, consider one that fits their financial situation, and stay on track. Up-to-date information: The revised Payback Playbook provides a borrower with updated information best suited to their financial circumstances. This helps borrowers stay on top of payments and know how much longer they need to make payments until their loan is paid off or forgiven. We look forward to continuing this work to ensure that student loan borrowers get the information they need to get back on track with managing their student loan debt. In the meantime, we want to hear from you — be sure to tell your story and share your experience with student loan debt. If you are having trouble with your student loans or with your servicer, Submit a Complaint.